During last year’s trip to France, whilst staying at our beloved dairy sheep farm camp site, Carol accidentally dropped her binoculars. Well, of course it was accidental – she’d hardly drop them intentionally, now, would she? They were relatively lightweight 9×25 Nikons, easy to transport but of modest quality. Though they may have bounced slightly, they were definitely of greatly reduced quality following their precipitous contact with terra firma and essentially were transformed into monoculars. Having resisted replacing them thus far, on Saturday afternoon we spun over to the RSPB at Sandy in Bedfordshire where they have a good selection of binoculars to test drive. Many samples were out tethered to a pedestal but they were all 8x magnification. Carol was really interested in some 10x magnification glasses which were all locked away in a display case. However, a very helpful and knowledgeable lady let Carol loose trying out almost everything available. “Take a couple of hours – it’s very important to be happy”, she said. 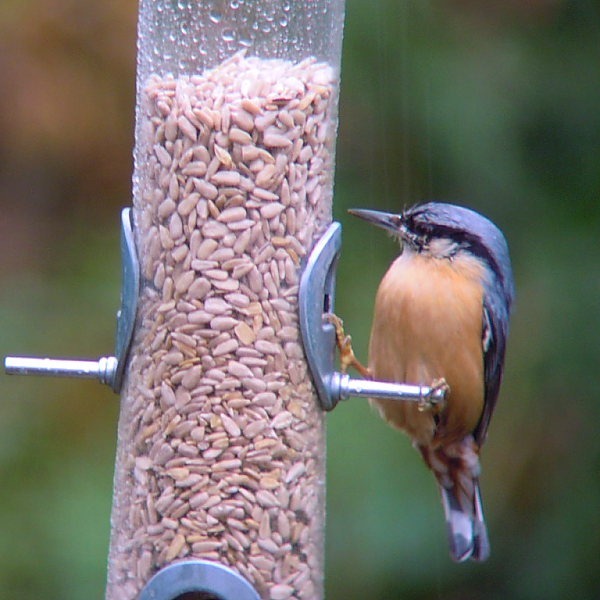 The main subjects for our binoculars are birds and, being an RSPB reserve, Sandy is a great place to test-drive them. 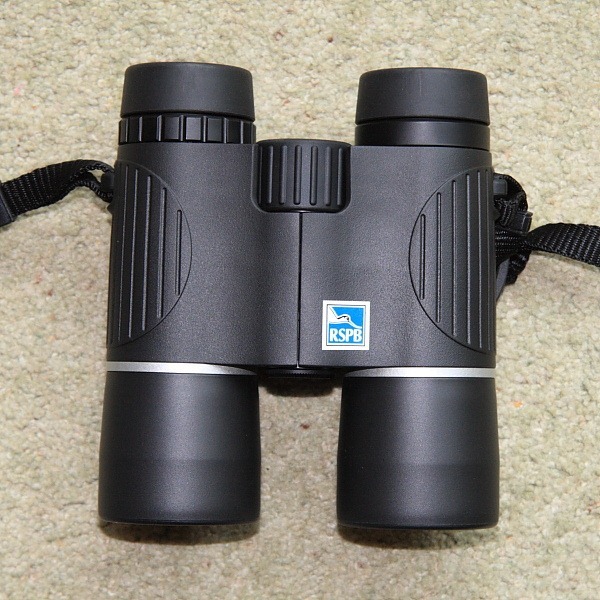 She eventually settled on a pair of 10×42 RSPB BG.PC optics – a very reasonable upgrade, IMHO. When one woman tells another woman to “take your time” shopping, the second woman naturally takes such advice to heart. Any attendant males are apt to get very bored. 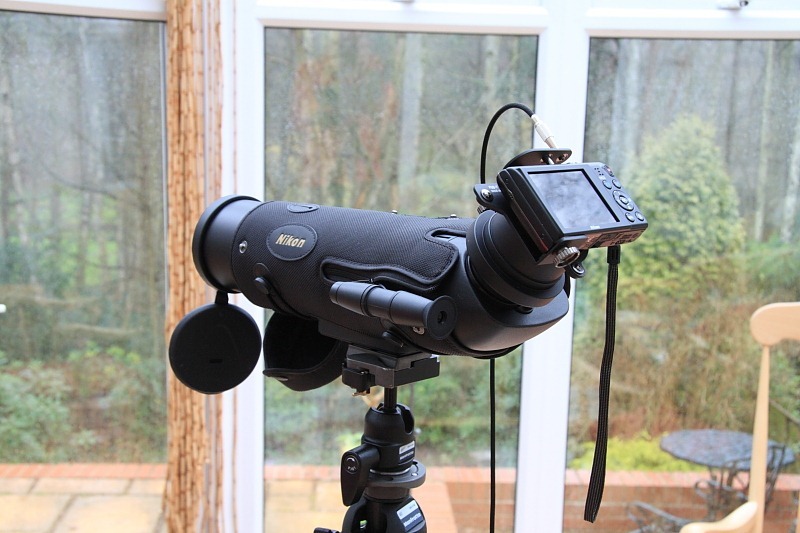 Fortunately, in addition to binoculars to audition, the RSPB shop had a few examples of spotting scopes available to try, mounted on the necessary tripods. Scopes are much more powerful than binoculars, typically being 25x magnification or more, hence the need to be tripod mounted. I’d been interested in them for some time but never tried one. 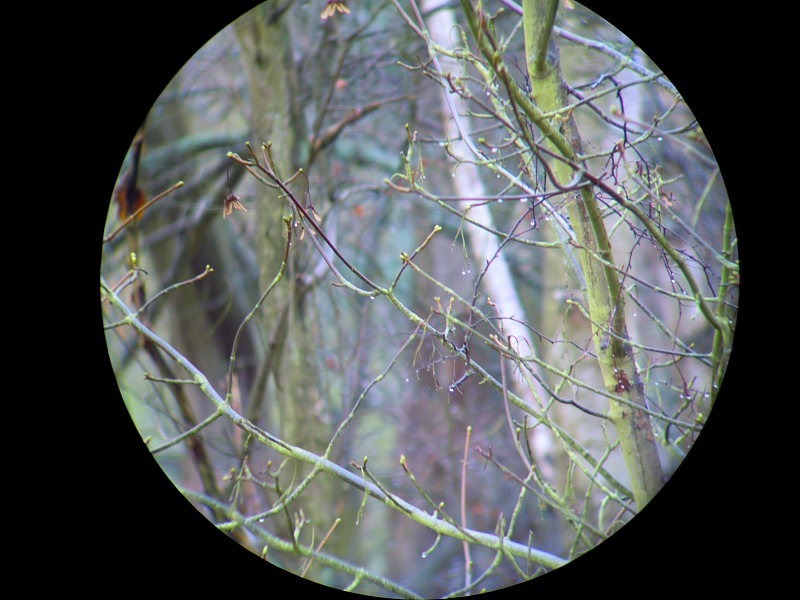 So, while the ladies played with binoculars, this attendant male distracted himself getting to grips with a few spotting scopes by training them on the RSPB’s many bird feeders at the reserve. I wasn’t particularly taken with a relatively cheap RSPB scope (£200) but a Viking scope (£600 without eyepiece) sitting beside it did impress. The funny thing about scopes is that the eyepieces are sold separately in the name of choice – some zoom eyepieces are available. The nice lady even told me it was possible, though not necessarily easy, to use multiple adapters to connect a digital SLR camera to indulge in digiscoping. Interesting but expensive by the time you’ve bought the scope, an eyepiece and several adapters. 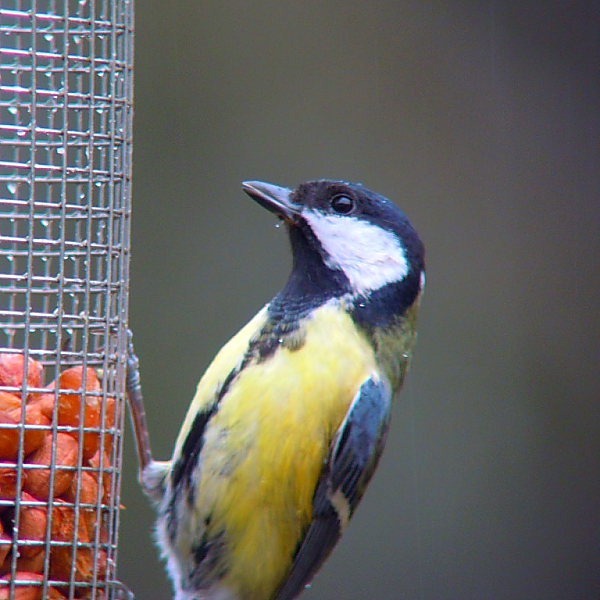 Trained through another window at yet another set of feeders was a Nikon spotting scope complete with a Nikon Coolpix compact digital camera attached. The nice lady said the Nikon scope was very good quality and set about removing the camera for me to try it. Sure enough – nice bright image and no edge distortion. “What’s the damage on this one?”, I casually enquired. “Ah, well, it’s actually part of the Nikon Digiscoping Coolpix S5100 Kit – everything you need in one box (except tripod): scope, eyepiece, camera adapter and camera with release cable all in one box. £499.” Interesting. We paid for Carol’s splendid new binoculars and joined the RSPB (just for good measure) and then walked out to the car. “That spotting scope was fun”, I said, starting the car. “The very portable little pocket camera might be handy sometimes, too”, I continued as the car continued to idle. “Get it if you want it”, said the boss. We stopped the car, returned to the shop and gave our credit card another battering. Here it is. The comforting thing about a kit, especially for the uninitiated, is that you know you’ve got the right adapters and that everything should work together. As a spotting scope, this new toy is pretty easy to use, though, even given its modest magnification of 20x, finding what you are looking for can be a challenge. A target sight is provided to help. Digiscoping successfully is more challenging. Easy, it ain’t! First off, when turning on the camera it starts in a relatively wide-angle view and this is what the camera sees through the scope. Very Hollywood! So, when you turn it on you have to zoom a little to remove the rather drastic vignetting. Focussing is also less than easy. The camera may have auto-focus but the scope doesn’t and it’s the scope that needs to be in focus. Thirdly, being a compact camera there is a short but noticeable time lag between pressing the cable release and the camera actually firing. Lastly, this rig isn’t something that can react to a mobile subject; it obviously works best with a relatively static subject. Having said all that, in the right conditions, it should be a useful addition to our armoury. It would, for example, have been very useful with the nesting hoopoes at Les Mathes in France, last year. Here’s a couple of very early bad weather attempts. Practice and more light should help. Oh dear, I wish you hadn’t written that! I can see my wishlist growing significantly now… Those pictures look pretty good to me. 1 Pings/Trackbacks for "Expensive Trip"